Well, that last one was a terrible resemblance, as pointed out by Tom Bickle. This one is rather better, I think. This actually _looks_ like my professor. I even have some proof of that. 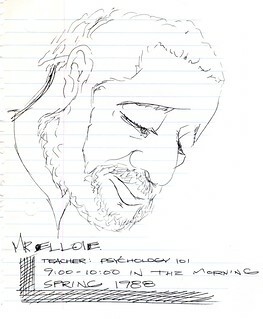 I used to draw a lot in his class, psychology is a great subject for drawings. Drawings to illustrate my notes, or just to doodle. After all, I think my major at the time was Fine Art, well, that was my declared major, inasmuch as a Community College student can have a major. I enjoyed that class. I liked to make arguments in that class. The Prof argued that we overused the word “love” so much as to negate its meaning. We “love” the symphony, we “love” our car, etc. I argued that love still had meaning as a word, because from context we can tell what people mean by what they say when they say they love something. Well, I love being able to share my meandering and rambling thoughts on this blog. Can you tell that that’s different from when I say that I love Leah? Oh, I’m getting pretty deep now. It’s striking to me that a class I took for a few months 17 years ago has left such vivid memories. And here I am disgorging them in a medium that did not exist when I had the memories originally. Joe Crawford blogged this at 9:00am in 2005 in August. The 27th was a Saturday. You are reading this 14 years later. Comment. There are 3 comments Tweet. Send email. It has hashtags→ drawings memories . Joe, I really liked this sketch. It has depth and personality. Gorgeous. There are some real gems in these archives o’ mine.